If you are an Ashby Village member or volunteer, but not a Watergate resident, please contact Marjorie Paul in advance. 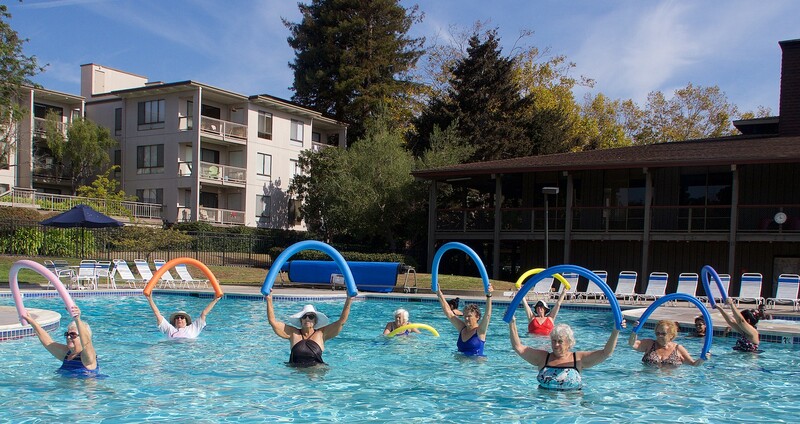 Join the Emery Bunch for weekly water aerobics. It’s open to AV members, volunteers and Watergate residents. *However, if you are an Ashby Village member or volunteer, but not a Watergate resident, please contact Marjorie Paul in advance. Marjorie can get you admitted as a guest so you can participate in the class. You can enter on Captain Drive, turn right immediately past the tennis courts and park in any of the designated visitor parking spaces next to the far side of the courts. Alternatively, you can park on Powell Street and walk down Captain Drive to the Clipper Club.